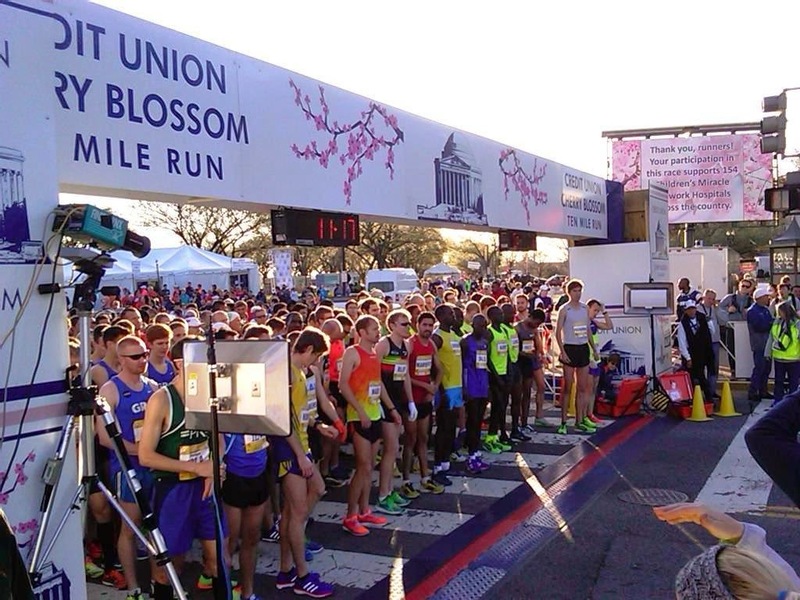 This is a report of my experience running the 2015 Credit Union Cherry Blossom Ten Mile Run. 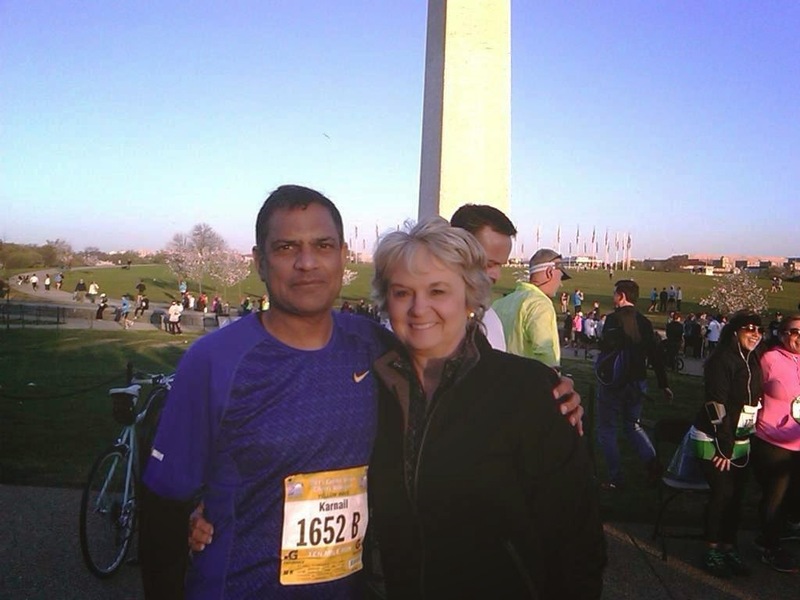 The CUNA Mutual Running Team took 6th place this year with team members Karnail Kooner, Retirement Sales Specialist and Alastair Shore, Chief Financial Officer rounding out our official corporate team. 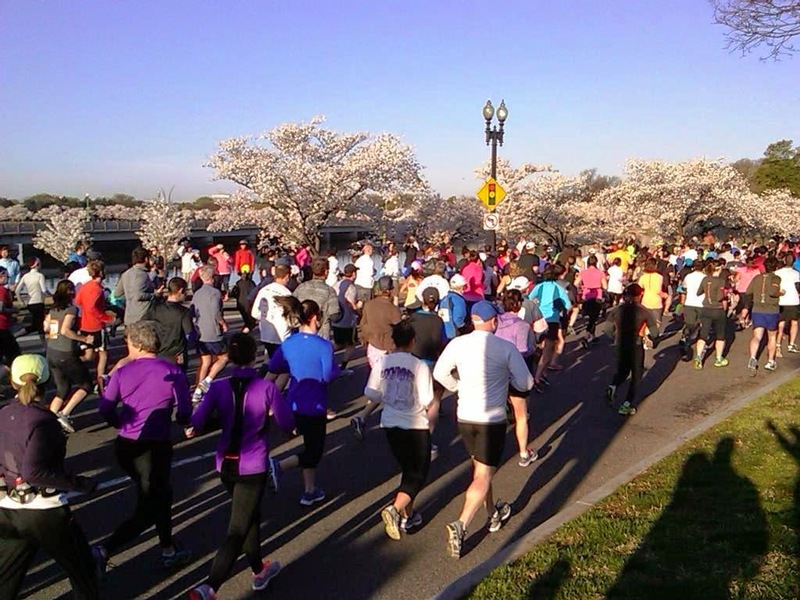 This year's Credit Union Cherry Blossom Run was truly different than all other years. 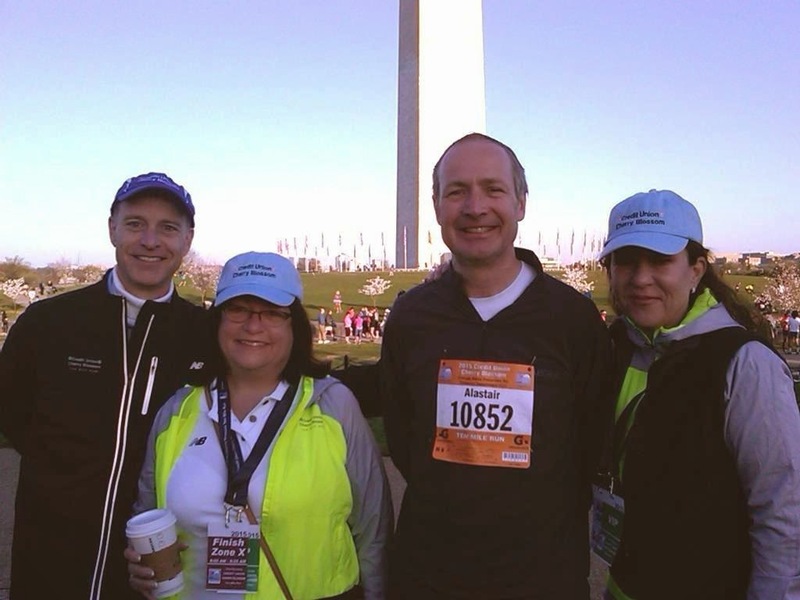 I have run this race since 2009--so it was the 7th year in a row for me--and maybe 7th is the charm. 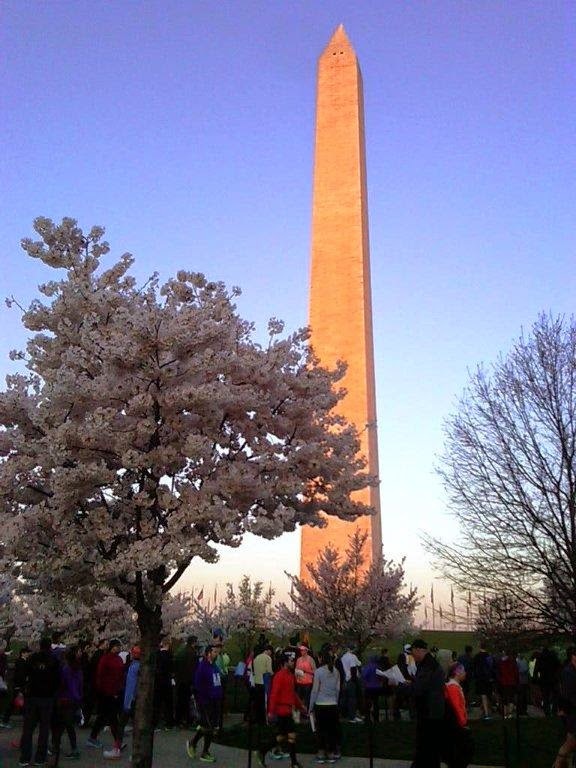 This was the first time in 8 years that the official 'peak bloom' day of the cherry blossom trees coincided with race day. That meant all of us standing on the start line at 7:30 am on Sunday, April 12--all 15,000+ of us--were about to get the VIP treatment: front row views of the canopy of fully-bloomed trees lining many parts of the 10-mile course, especially in the cherry-blossom-tree-dense area of Hains Point. 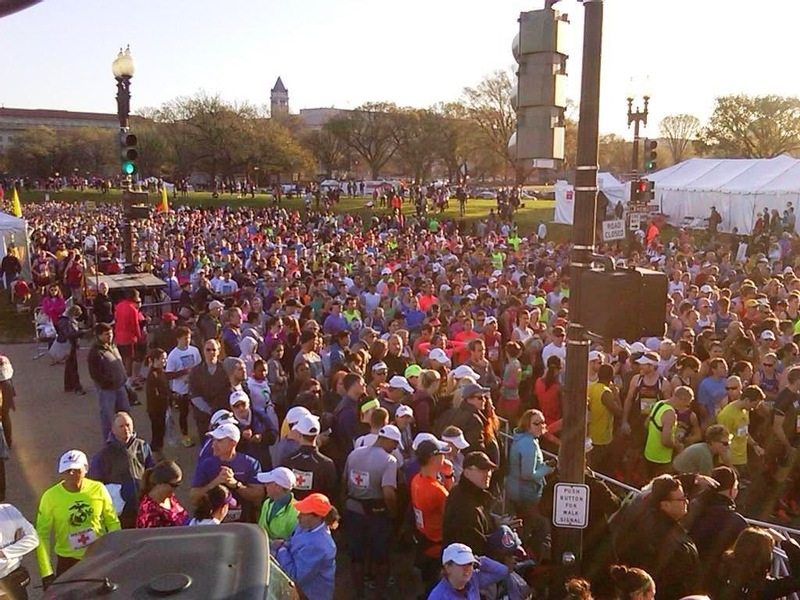 Which leads me to another reason this year's race was different than any other I have run, and what I was told by countless local runners over the years--Hains Point is a dreaded stretch of land, a thing of legends for local runners, because it is always excessively windy here. Even on calm days, the wind picks up off the Potomac and the long stretch in one direction for over a mile can make even the steeliest runners question their strength into the face of stronger winds. But not this day—this day the wind wasn't even strong enough to knock the petals off the delicate flowers above. So in addition to the endless blue sky filled with beautiful pink blossoms, we had little more than a gentle breeze which merely carried the flower's delicious scent down to the runners. 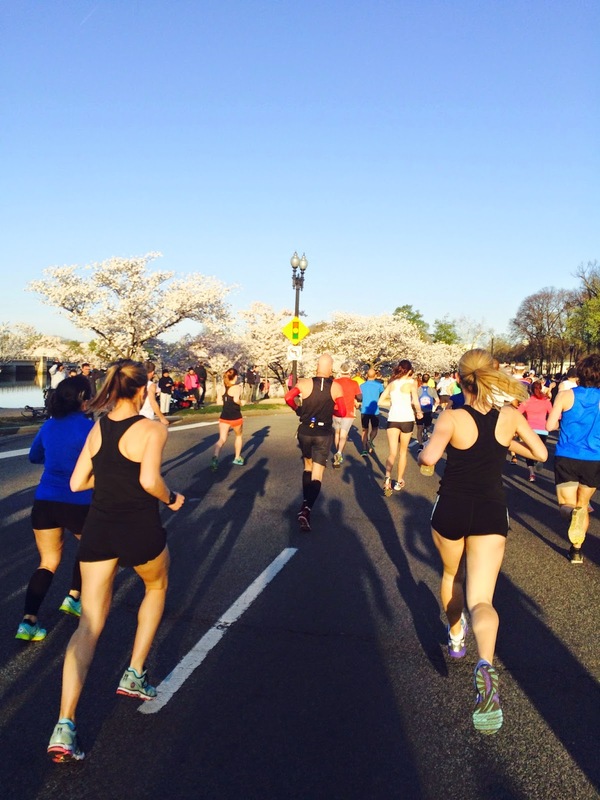 It was a Hains Point anomaly that was much welcomed by runners young and old, novice and pro. Yet another curiosity of this year's race...the 10 miles wasn't quite 10 miles this year. Unfortunately, about an hour before the start of the women's elite race, there was an accident along a stretch of the designated race course, which forced organizers to re-route miles 4-6, which go around the Tidal Basin, in another direction before reconnecting with the established route at mile 6. This 2-mile route replacement, as best as organizers could match, was only about 1.4 miles. So in the end, we all ran an approximately 9.4 mile “Ten Mile Run.” Needless to say, it was a personal record for everyone that day! I can't say I minded the bit of a break, and psychologically I think it gave me more energy to push harder knowing it would be a little different route and a little shy of the full distance. I'm sure some runners were upset, as neurotic as we are, since when we say we will run 10 miles we HAVE to run 10 miles, even if it means circling the parking lot until our watches beep the completion of that last mile. 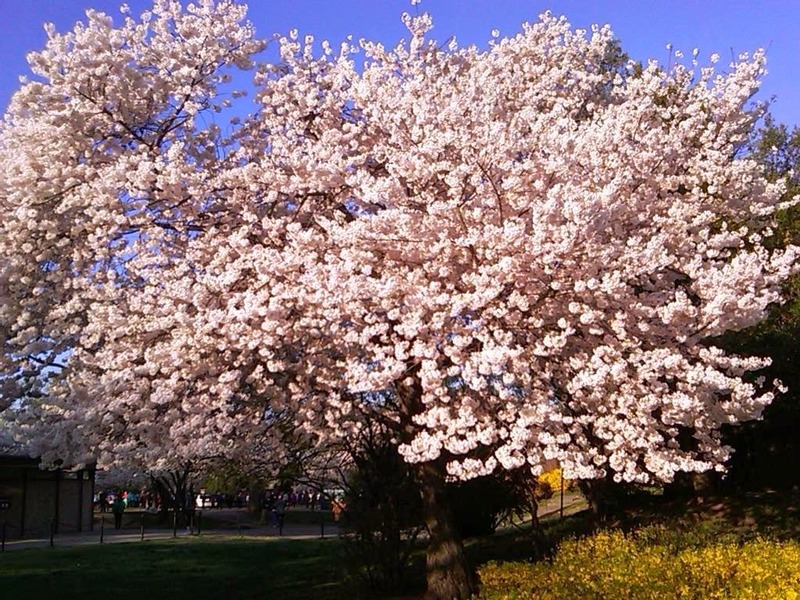 But this day for me was a day to simply enjoy the sites, the blossoms and the race. So I had no complaints. Also a big kudos to race organizers who swiftly and seamlessly redesigned the flow of 15,000+ people on an hour's notice! It could have been a catastrophe but instead most runners didn't even notice the reroute. I've run this race in faster times (even with the .6 mile shortage my full 10-mile times have been faster); I've started with the elite women; I've finished 22nd place overall female and 5th in my age group. 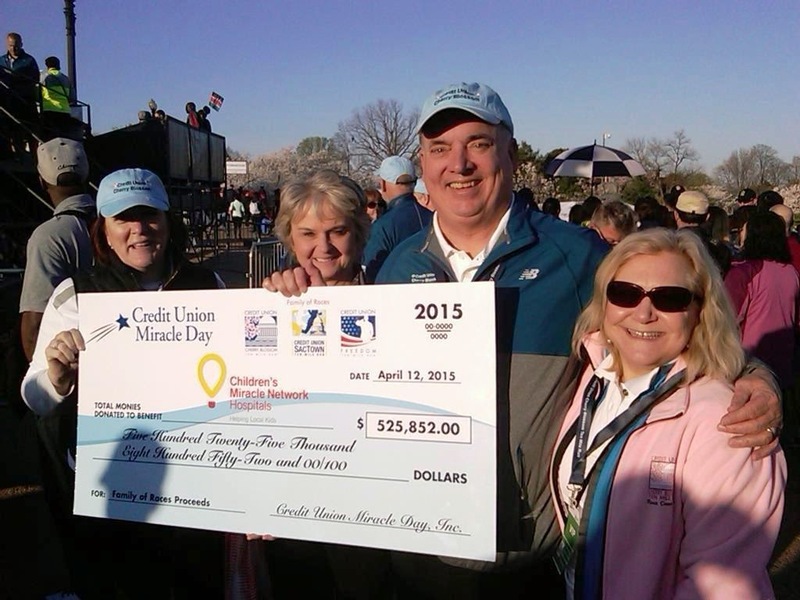 The CUNA Mutual team has taken first place in the corporate challenge. I've raced in rain, under raining petals, into tough winds and in years where the blossoms were not yet out or long since gone. 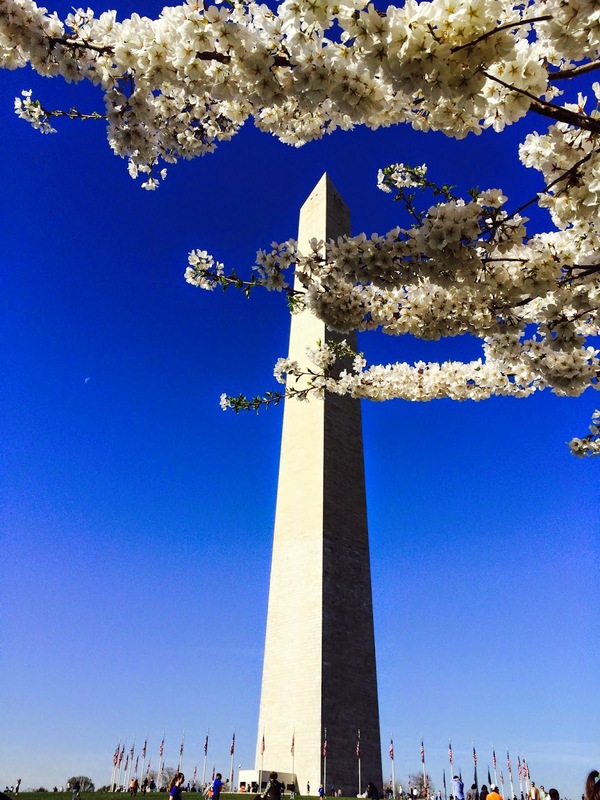 But never before on the peak bloom day with beautiful weather and among runners who, for better or worse, had to let go of their serious attitudes a little bit, and just enjoy the 9.4 mile race we were embarking on. 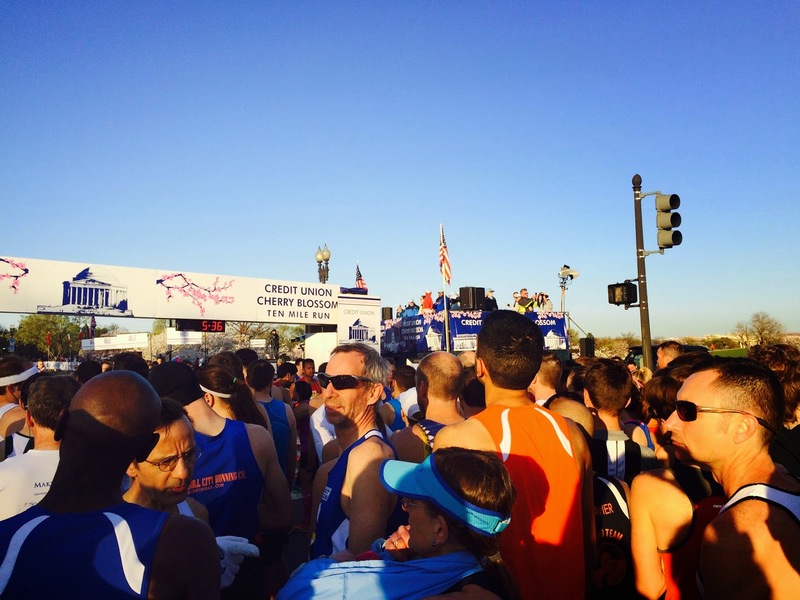 In the end, more than $525,000 was raised by this race and its sister race held on the same day in Sacramento--the SacTown Ten-Mile Run. 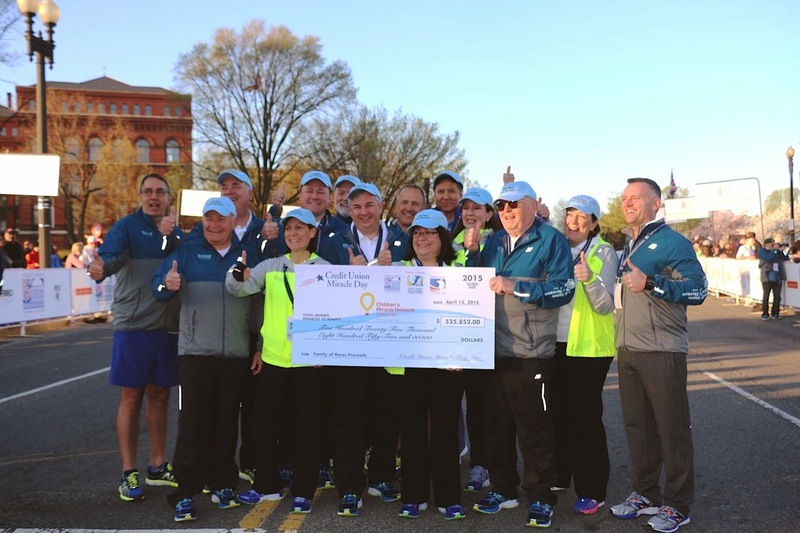 Close to $100,000 of that amount was raised by us runners. This money directly benefits more than 170 Children's Miracle Network Hospitals across the county, serving millions of children, despite the family's ability to pay. Elliott Pitts (Children’s Miracle Network Hospitals). One of those children benefiting directly from the existence of these facilities is my 9-year-old nephew who was diagnosed with type 1 diabetes 6 years ago and treated at the Children's National Medical Center in Washington, D.C. Nothing makes me more proud, happy and sure I picked the right industry to work in, than participating in this race, put on by the nation's credit unions and sponsored by CUNA Mutual, as the biggest single fundraiser for Credit Union Miracle Day to benefit Children's Miracle Network Hospitals and millions of children across the county. credit unions in the nation. 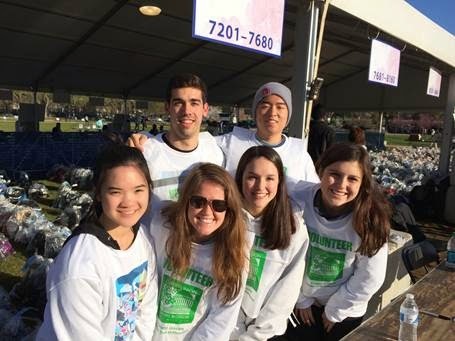 Read our team's pre-race report here to learn more about Children's Miracle Network Hospitals, Credit Union Miracle Day, and why this is event is so important to us!